The decoration of the bathroom surfaces with the help of facing tiles is the most popular option for finishing not only in our country, but also in the world. It is difficult to find an equally durable, moisture-resistant, heat-resistant reliable and durable material for facing walls in a room with its unique microclimate. 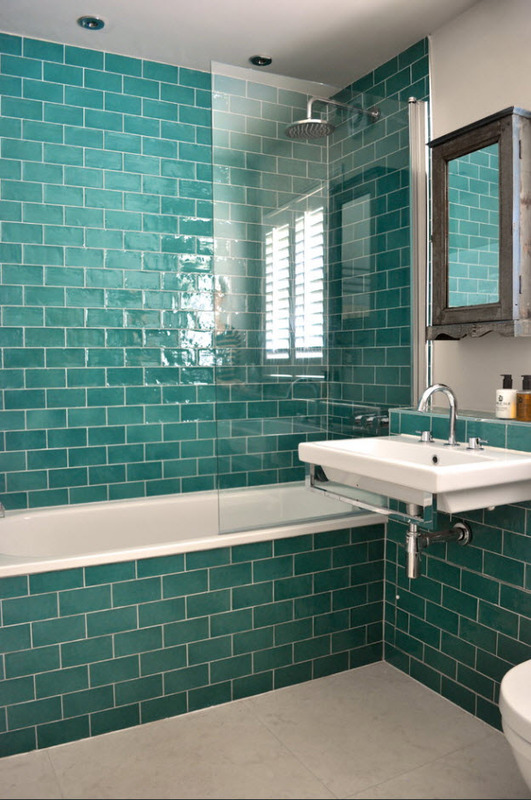 Facing tiles are good both in solo use and as an element of combined bathroom finishing. Like most interior design areas, the tiling of bathrooms has its own trends, actual design ideas and designer novelties. We suggest you to have a brief look at them on example of our large-scale selection of bathroom tiles trends with photogallery of interiors 2017. Repair in the bathroom is usually done for several years. Therefore, the material for finishing surfaces should be chosen with certain technological qualities – a high level of moisture resistance, resistance to temperature changes and mechanical impacts. In addition, such utilitarian rooms as a bathroom and toilet require maintaining cleanliness close to ideal, which means that the finish should be easy to wash and safely withstand the effects of cleaning chemicals. You will probably agree that few finishing materials are able to make such a test for strength. But ceramic tiles (we often mean it speaking of the facing material for the bathroom) are capable of maintaining its original appearance for a long time. A large selection of manufacturers with different cost of goods allowing you to find a solution for the design of the bathroom for owner of apartments and houses with different financial capabilities. When using a curly tile or a mosaic, a large number of interlace sutures is formed, which can cause occurrence of fungus. Prevention with antiseptics and periodic replacement of the grout are necessary. The most popular material for the production of tiles is ceramics. Reasonable price-quality ratio, technological and aesthetic characteristics, made ceramic tile practically synonymous with finishing in the bathroom. Ceramic tiles can be of different shapes and sizes, plain or patterned, smooth or textured, with imitation of wood or stone, homogeneous or with different inclusions. There are tons of options for creating the finishes of your dream. Advantages and disadvantages of ceramic finishing we disassembled in the previous block, but I would also like to note other versions of the facing material. Finishing the bathroom with glass tiles is infrequent, and the uniqueness of such design projects is much higher. 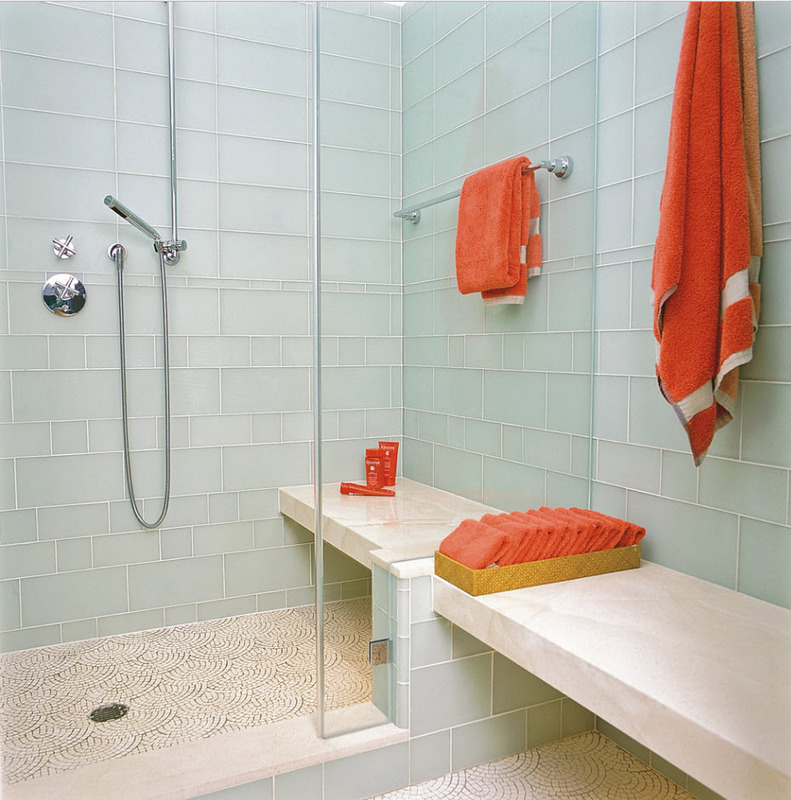 Even small insets of glass tiles can “revive” the most ordinary image of a utilitarian room. But this material has its drawbacks – in addition to the high enough cost, the glass tile always creates a somewhat cool image of the room. Glass tiles are often produced in color. Many owners of houses and apartments choose this material to create a panel on the bathroom with photo printing. A drawing can be anything from a beautiful landscape to a family portrait. Facing tiles are made of granite, marble, basalt, sandstone and other stones. But the high cost of finished products, marble in particular, pushes homeowners to purchase artificial analogs that are not inferior in aesthetic qualities. Very often, tiles made of artificial material are impossible to distinguish from natural raw materials, but the physical properties of such products, of course, may vary. Apparently, an artificial stone will not serve for your family for decades, but it is much cheaper than natural analogue, it is lighter and easier to assemble. Imitation of marble always brings a luxurious image, a touch of elegance and nobility to the interior of the bathroom. Such a finishing material is perfect for creating modern images of rooms, as well as classical interiors. If a metallic powder is added to the ceramic for making tiles or mosaic, the result always exceeds all expectations. Products with silver, golden or copper luster can bring a festive, luxurious mood to any interior. It is appropriate to use metallized tiles as a decorative element, not deprived of all the advantages of ceramic products even in small areas. No less effect can be achieved by using a mirror tile – it can allocate zones, emphasize the geometry of the room or simply create original compositions, panels. Personal preferences of the owners of the utilitarian premises. Tiles of large sizes visually able to increase the volume of the room (though, for this it is better to be executed in light colors). Recently, it is fashionable to use large rectangular products made of ceramics and porcelain stoneware not only for facing the floors, but also for finishing the walls. But it is important to understand that in a small room with the wrong geometry of the waste, the finishing material of larger sizes will be larger than when choosing the appropriate scale scales. 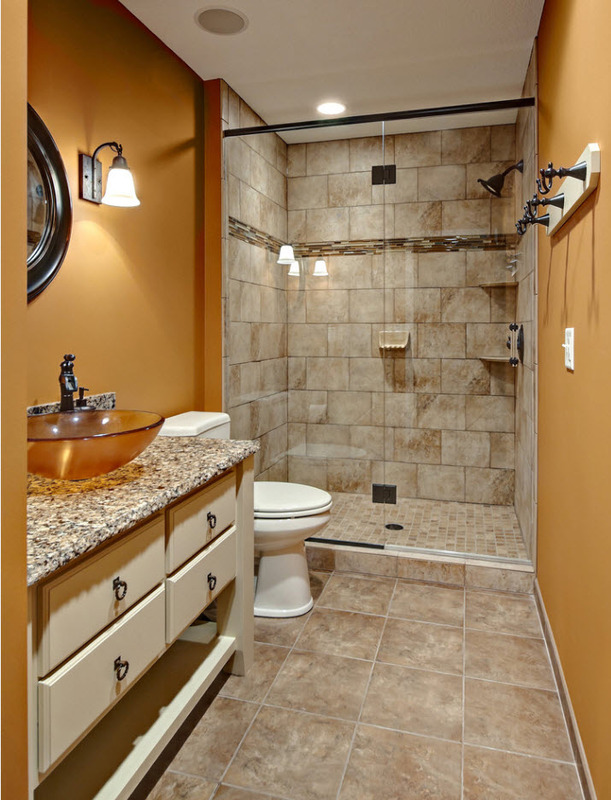 The “subway” tile has become very popular lately. The name of the finishing material was due to the initial use for the design of underground stations. And at the present time, masonry, laid in the type of brickwork, is considered one of the classic options for decorating bathrooms. 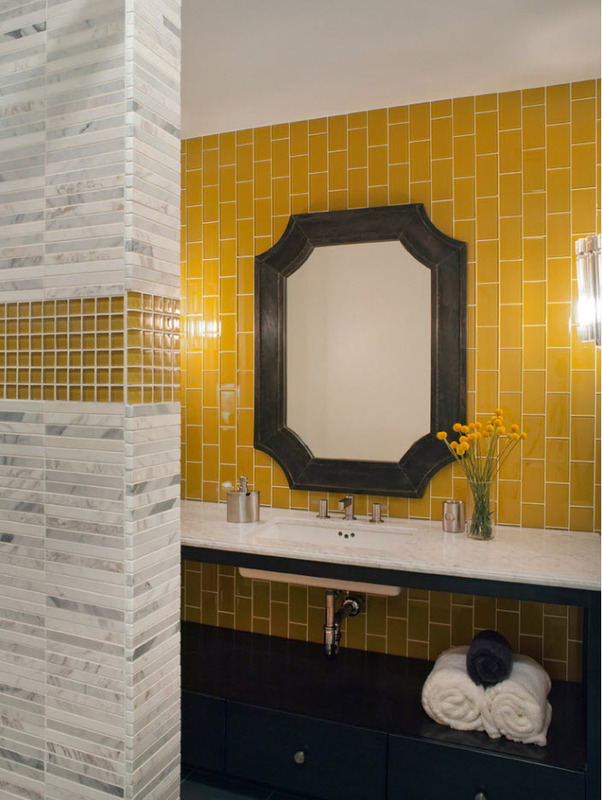 The “subway” tile can be glossy or matte, smooth or with bevels around the perimeter (so-called fezes). It can be used with a trowel of a similar tone or a contrasting hue. 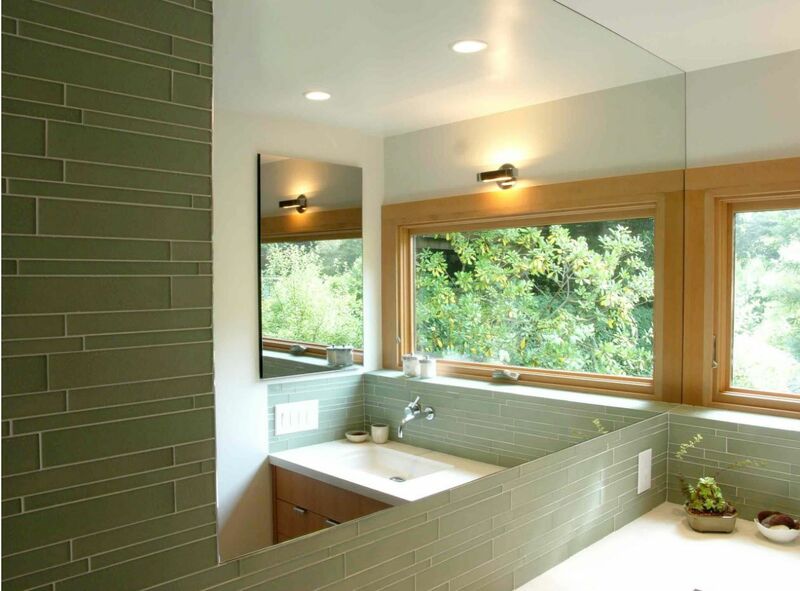 Depending on this, different images of bathrooms are obtained, even when using tiles of the same size and color. The dark “subway” tile in combination with a light trowel looks especially impressive. The geometricity of the masonry is emphasized by the contrast of colors. Such a spectacular image of the bathroom can be achieved by using a dark or bright trowel between a light, pastel ceramic tile. And the original “herringbone” styling will not only bring a variety in the finish of the bathroom, but will also make its interior more creative. Finished with tiles, which is often called “honeycomb”, bathroom has the original look of any surfaces. Ceramic hexagons truly resemble honeycombs and are available in various sizes and colors. Mosaic has all the technological advantages of ceramic tiles, but it can be used to finish complex, in terms of geometry, surfaces. 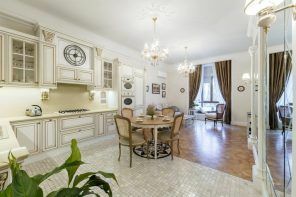 Arched and conventional niches, countertops near the sink, bath façade, storage systems and various accessories for utilitarian spaces can be faced with mosaic tiles. The mosaic is produced with a different size and shape of so-called chips (small dice). Mosaic, as well as ceramic tiles, can be smooth or textured, monochrome or with colored inclusions, imitate masonry, have a metallic luster. 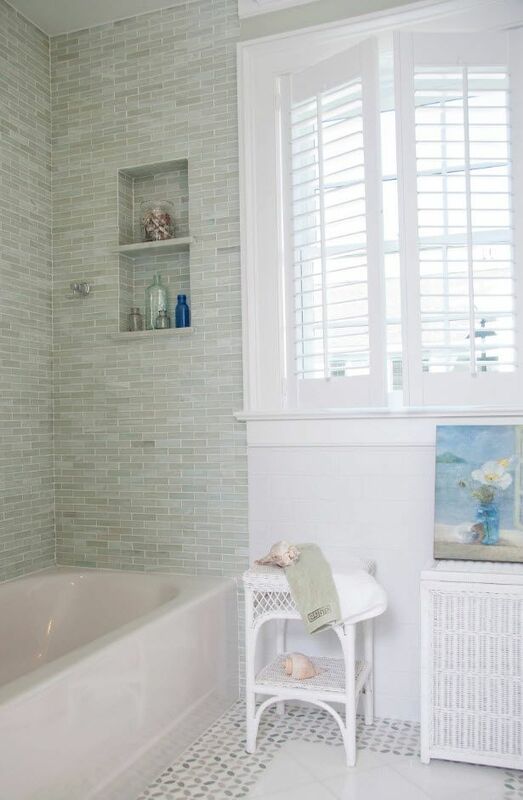 With the help of a curly tile, you can glaze both the walls and floors of the bathroom and create an accent surface. Even a single-colored tile of light tones looks unusual, original, thanks to its unconventional form. But the curly tile has its drawbacks – the length of the intertwist seams is substantially larger than this index of usual shape material. So, it will require more grouting. And the risk of fungus formation without timely treatment will be higher. But all these minor imperfections overlap the original design of the material itself and the resulting surfaces. Textured tiles can bring not only the variety, but also the creativeness to the bathroom interior. As a rule, relief products for facing the walls are made in a monochromatic light version, and all the texture bends, basins and bas-reliefs are emphasized with the help of lighting. 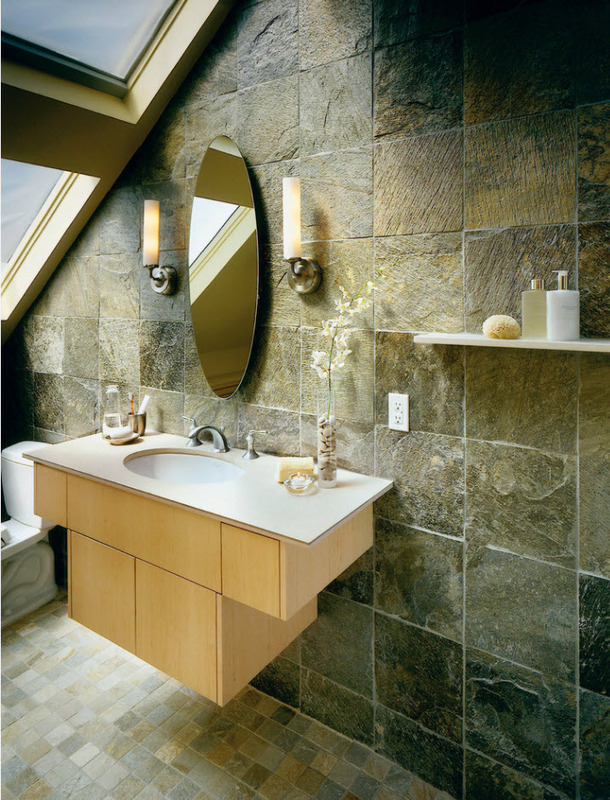 Most often, textured tiles are used for facing one wall to create a certain accent. Combining facing tiles in different shapes, sizes and colors can lead to the creation of not only attractive, but also creative images of bathrooms. In addition, by using colored inserts, it is possible to distinguish those or other elements and interior zones, visually change the room volumes and create color accents, so necessary in a bright space. Color edging on a light background is trendy option to revet the mirror, outline the panels or highlight the shower, bathtub or sink zones. No less effect can be achieved by combining tiles of the same shape and size, but of different shades from one color group. This method of decoration can be used both for decorating walls (or their parts), and as a floor covering. In addition, ceramic tiles can be combined with other types of finishing materials. Of course, tiles should be used as a finishing of the most vulnerable areas in terms of moisture – around the bath and the sink, inside the shower room. 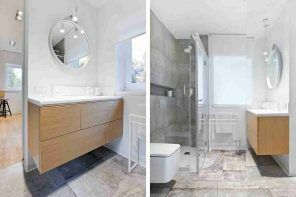 Most often, they lay so-called splashback out of the tile or finish the surface behind the bathroom completely – it all depends on the location of the plumbing in the bathroom. There are certain color trends that are dictated to us by designers around the world. But there are also color solutions that will be relevant at all times. 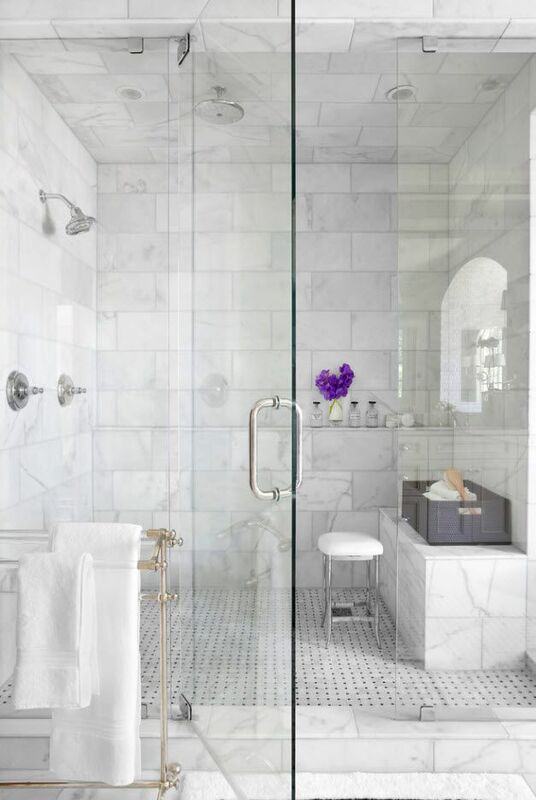 If your bathroom has a very modest area or a non-standard form, then white tiles can be the only worthy choice for creating a light and airy interior image. White is associated with cleanliness and freshness color for most of us. These are important qualities of the room for water and sanitation procedures. 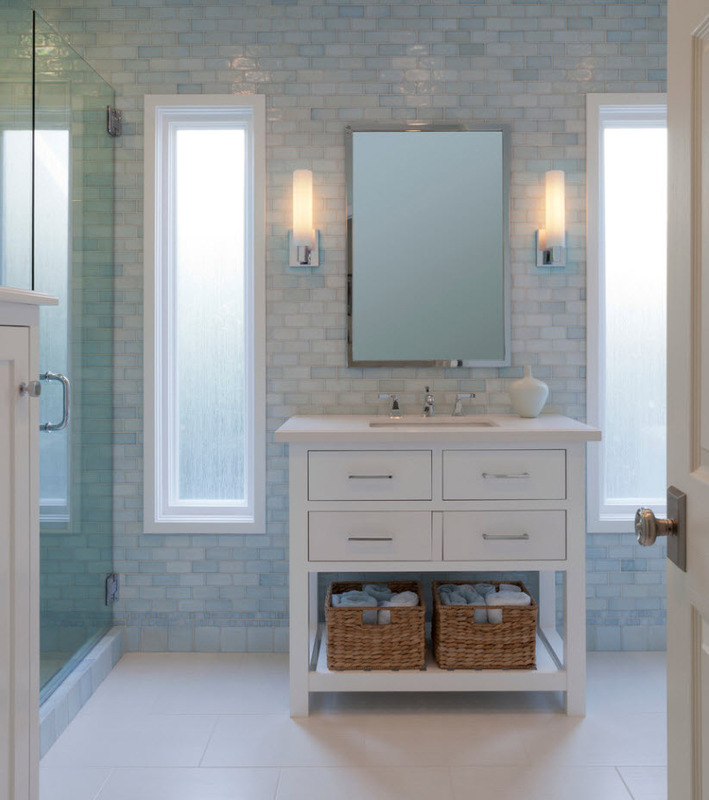 On a white background, the gloss of chrome accessories for the bathroom looks great and any variant of storage systems and other additional interior elements match perfectly. Became so popular last season, gray color, does not lose its leading position in the top-sheet color solutions for the premises of the most diverse functional load. The bathrooms are no exception. A rich palette of gray shades allows you to make strict, but elegant images of utilitarian premises, not devoid of its zests. 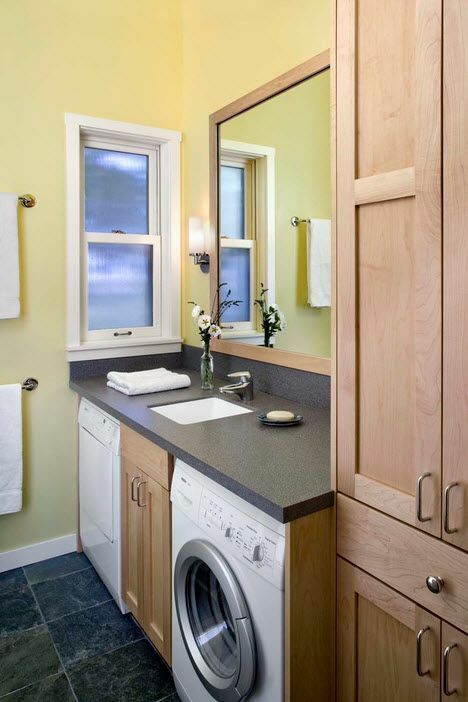 In addition, on a gray background, the brilliant whiteness of the plumbing is especially impressive. 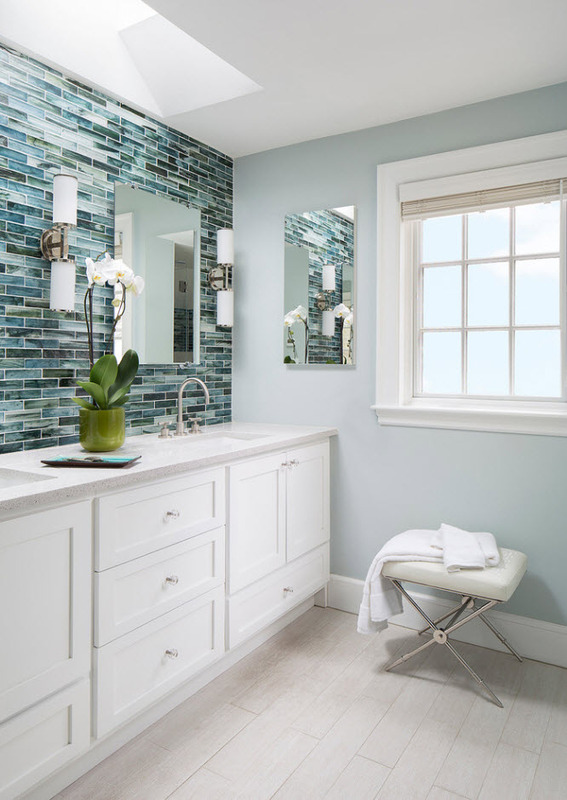 For many years, a wide range of shades of blue is considered a popular color solution for decorating a bathroom. From pale blue as the main background to dark blue in the form of accent edging or small inclusions – this color always creates a cool, light and fresh atmosphere in the interior of the utilitarian space. 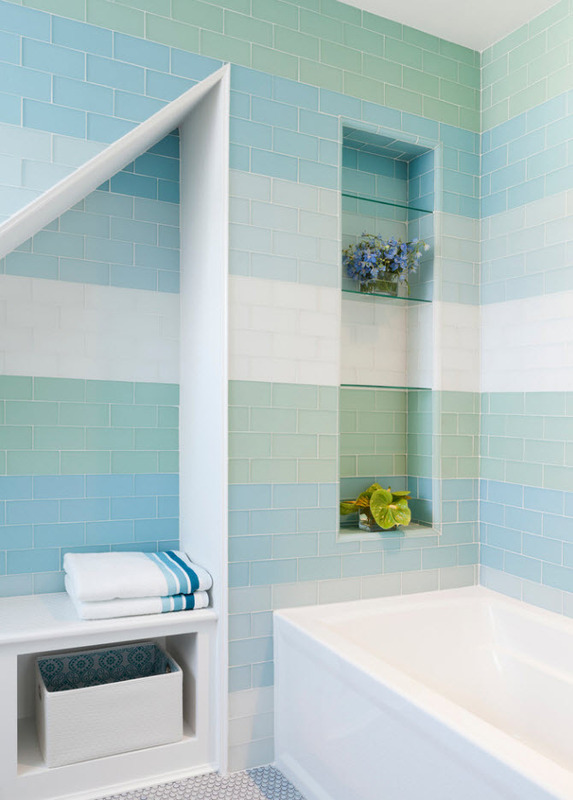 Snow-white plumbing is perfectly combined with different shades of blue tone. 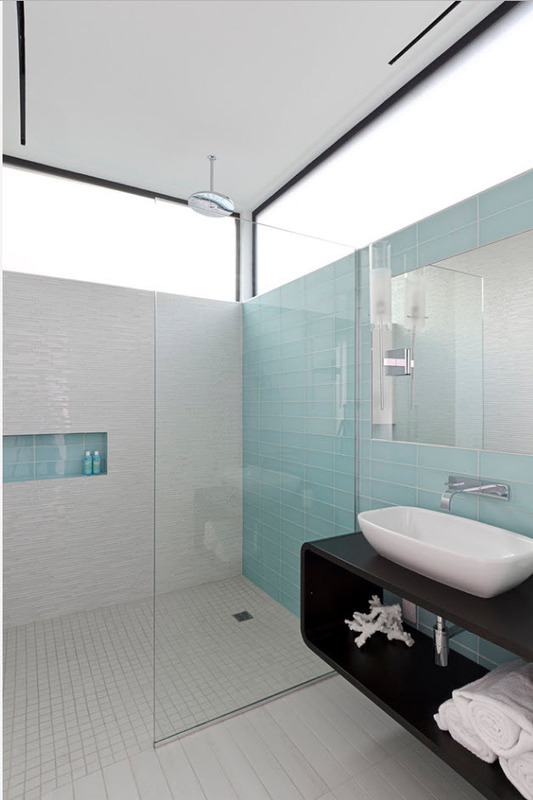 Many designers recommend using glass partitions and sliding doors of showers of a light-blue tone in the alliance with a tile of similar shade. If creating a cool color palette in the bathroom does not suit you. If instead of vivacity and tone in the morning, you would like to receive a warm atmosphere and relaxation, you can refer to beige palette for decoration of your utilitarian space. 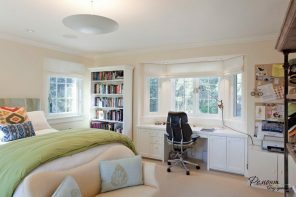 All shades of beige can be considered neutral in terms of creating a certain atmosphere in the room, but they definitely bring warmth to the character of the room and its atmosphere. 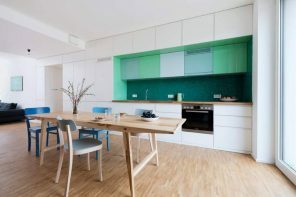 Many varieties of green shades and hues have become fashionable on the wave of popularity of all natural, including palette for interior decoration. All shades from light olive to dark moss and deep emerald are actively used by designers around the world. 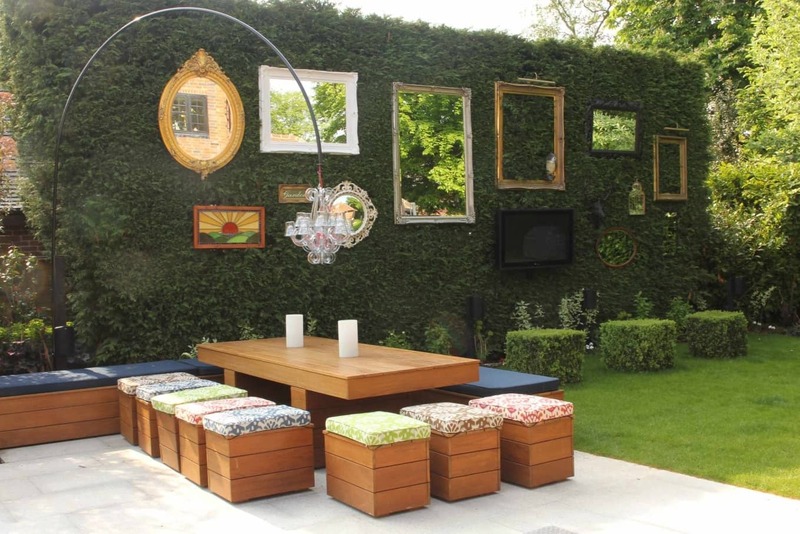 After all, green color favorably affects our psyche, contributes to the creation of a fresh and relaxed environment. 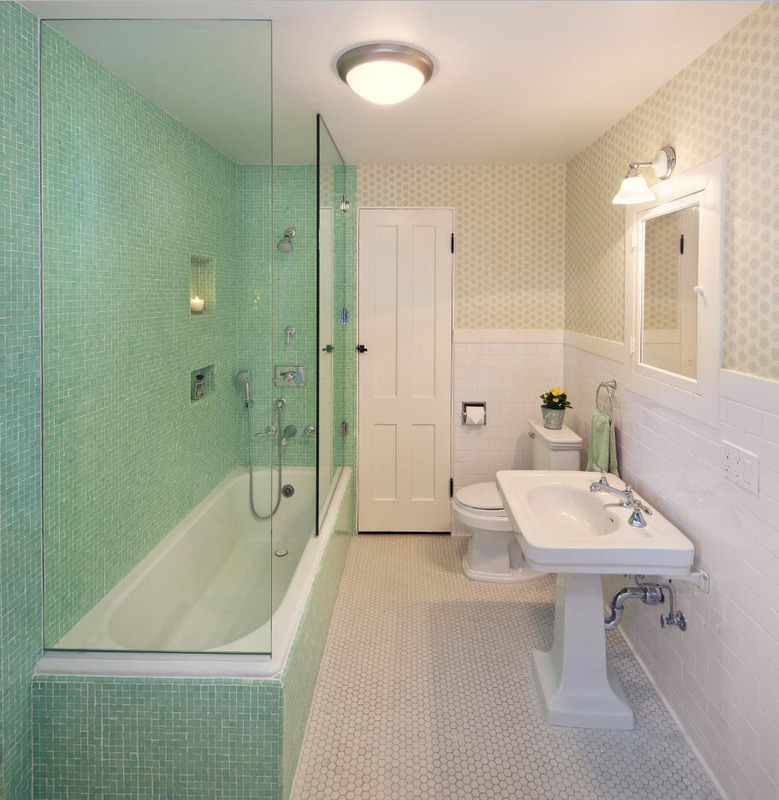 But the interior of the bathroom, which was decorated with a shade of green, can never be called boring and ordinary. 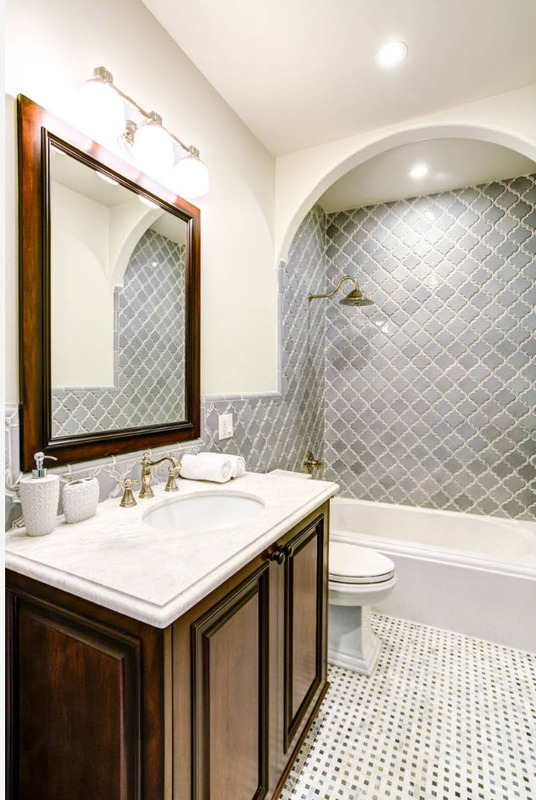 Tile with ornament – to be or not to be? Designers who create modern projects are increasingly inclined to one-color options for decoration ceramic materials. But the use of tiles with mottled ornaments or patterns is simply necessary for some stylistic trends in the design of dwellings. For example, some varieties of country styles (Mediterranean, Beach-, Eclectic and Rustic), can easily take a bright print of ceramic tiles, and also to win in terms of originality. 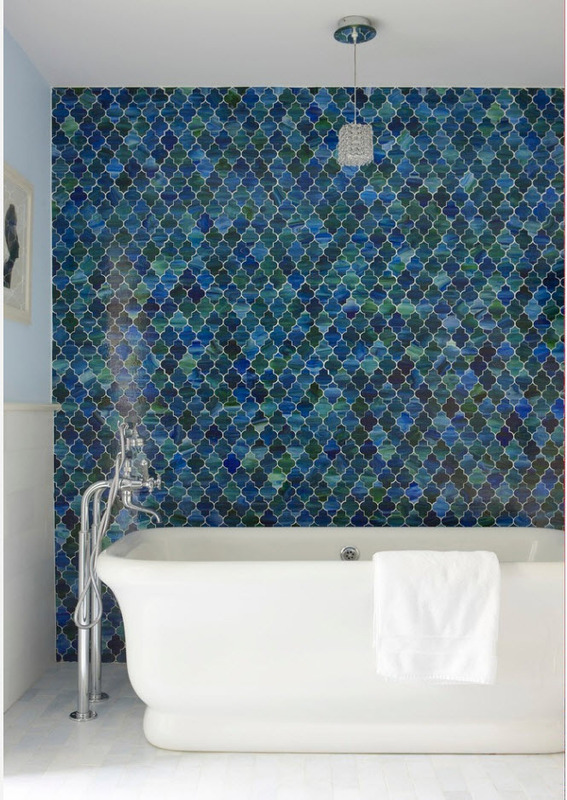 The most organic look has the tile with a bright, colorful ornament as a flooring material in the bathroom with monochrome light walls. Two contrasting colors are enough for the execution of such a tile with a print.